Is it an eyesore, or is it abstract art? This striking addition to the visual landscape is located at 20940 Ventura Blvd. in Woodland Hills. 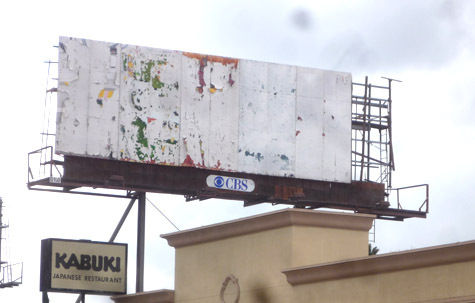 CBS Outdoor is a division of CBS Corp., which earned $3.5 billion in revenue the last quarter of 2009, but with such a far-flung media empire maybe it’s unreasonable to expect the company to check on the condition of a billboard creating visual blight in one L.A. neighborhood. See other CBS Outdoor eyesores here and here. What is amazing is that it stayed BLANK. Many billboards in the SF Valley are covered with graffiti vandalism. And the vandal’s know that their ‘work’ will be lit at night. It takes an act of God and Congress to get the billboard companies out here to repaper their ads, too.